Texas Gov. Rick Perry renewed a 2011 drought declaration for much of the state due to continued, prolonged drought conditions. 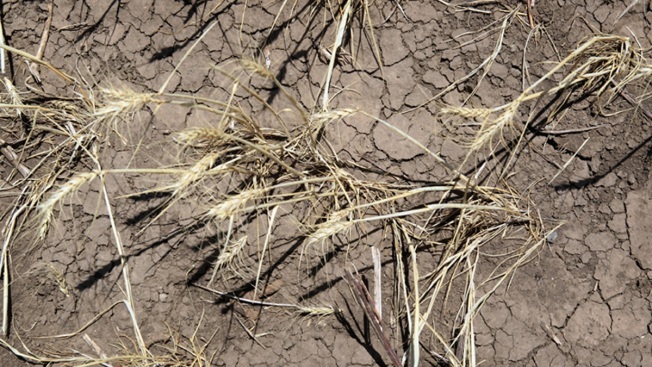 The renewal of the proclamation said the exceptional drought conditions pose an imminent disaster in a number of Texas counties. The counties named in the proclamation are: Archer, Armstrong, Bandera, Baylor, Bexar, Blanco, Bosque, Briscoe, Burnet, Callahan, Carson, Childress, Clay, Collin, Collingsworth, Colorado, Comal, Comanche, Cooke, Cottle, Crosby, Dallam, Dallas, Denton, DeWitt, Dickens, Donley, Eastland, Edwards, Ellis, El Paso, Erath, Fisher, Floyd, Foard, Fno, Garua, Gillespie, Gray, Grayson, Hall, Hansford, Hardeman, Hartley, Haskell, Hemphill, Hidalgo, Hood, Hudspeth, Hutchinson, Irion, Jack, Johnson, Jones, Kendall, Kerr, King, Knox, Lamb, Lipscomb, Llano, Matagorda, Mclennan, Medina, Montague, Moore, Motley, Nolan, Palo Pinto, Parker, Parmer, Potter, Randall, Real, Shackelford, Sherman, Somervell, Stephens, Stonewall, Swisher, Tarrant, Taylor, Throckmorton, Tom Green, Travis, Uvalde, Val Verde, Victoria, Walker, Wharton, Wheeler, Wichita, Wilbarger, Willacy, Williamson, Wise, Young and Zavala. 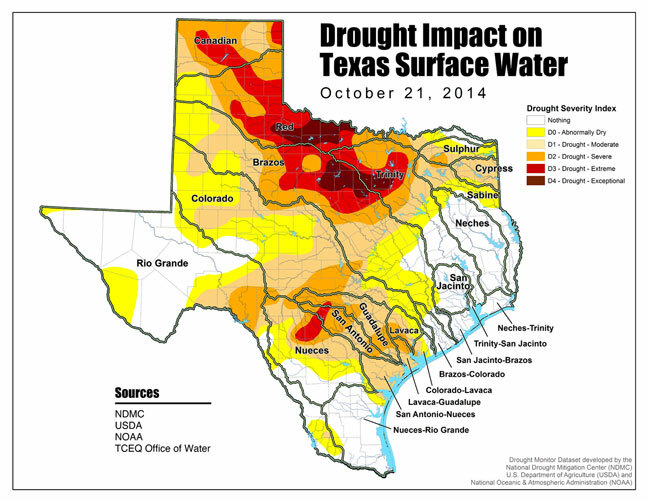 Drought Impact on Texas Surface Water -- Oct. 21, 2014. According to the Texas Commission on Environmental Quality, based on information from the U.S. Drought Monitor and the U.S. Department of Agriculture, much of North Texas and areas to the west remain under extreme or exceptional drought. Most of the state is at least under abnormally dry or moderate drought conditions. NBC 5's Rick Mitchell said last week that measurable rain for 2014 totaled 18.06 inches and that normal rain through Oct 23 would total 29.72 inches. Mitchell added that this has been the 14th driest year on record out of 116 years of recorded measurements. A slight chance for rain exists for North Texas Monday night into Tuesday. Beyond that, the next best chance for rain comes just before Election Day.